THE LAST drops of the thundershower had hardly ceased falling when the Pedestrian stuffed his map into his pocket, settled his pack more comfortably on his tired shoulders, and stepped out from the shelter of a large chestnut tree into the middle of the road. A violent yellow sunset was pouring through a rift in the clouds to westward, but straight ahead over the hills the sky was the colour of dark slate. Every tree and blade of grass was dripping, and the road shone like a river. 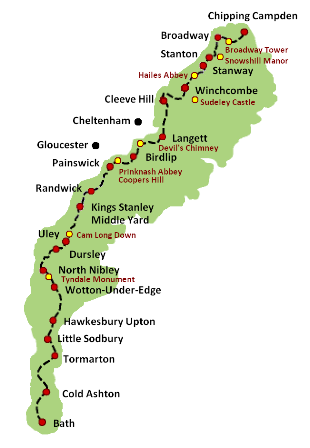 This little nugget was my first introduction to the concept of a British countryside walking tour. Here’s how these walking tours work: there are many publicly protected “footpaths,” often hundreds of years old, that honeycomb the British countryside. Anyone sticking to these footpaths is free to stroll through otherwise privately owned lands. Many of these footpaths are dotted with cozy inns strategically placed a day’s walk from each other, which grants the walker assurance of a warm meal and a place to stay at the end of a long day. Often such tours span numerous days. Something about this inn-hopping, English countryside hike resonated with me. Get up in the dewy morning. Eat a hearty breakfast and hit the rolling countryside. Forests, ruins and ancient drystone walls. Pastures, sunsets and kissing gates. Did my ancestors ever trod paths like this? Did they travel lightheartedly across the countryside to some forgotten purpose? Over the decades, the desire to take one of these hikes became so strong that I began to consider it as a kind of aimless pilgrimage. Sustenance for my metaphysical me. There’s a sense of connecting with the real past. Touching the things my ancestors touched and experiencing the raw beauty of nature in the same way they must have. I want to sit in a slouching 17th-century pub, ceilings too low for my stature, and drink a pint a traditional beer and listen to a folk song and forget about the last 200 years. I want to get lost in history. Walking and talking are two very great pleasures, but it is a mistake to combine them. Our own noise blots out the sounds and silences of the outdoor world; and talking leads almost inevitably to… [a] farewell to nature as far as one of our senses is concerned. One wayfarer wandering without words. I intend to chronicle my adventure here. If your August is slow, come along for the stroll.